Films by Fatih Akin slowly developed a love for the city of Istanbul in me, along with my fellow 'film society' friend -- Nafis. One could see actors driving in crazy adventures from Germany in Im Juli, crossing the bridge over the continents and standing with a view of the blue mosque in the distant horizon, with a haunting Turkish soundtrack as the backdrop. After taking a huge risk with visas and flights (budget airlines without food, for students that we are), heartbreak and excitement in the last moment, I finally arrived in Istanbul with Nafis and Uupol. We were there to realise a dream; the Bosphorus was calling! On the first day we actually stood at the bank and basked in the beauty of Istanbul over the water. It was after a walk through the Gulhane Park in Sultanahmed area, where we went for an iftar picnic, we crossed over where the Turkish flag stood, walking a bit and staring out into the city where the continents meet. The Bosphorus divides the city into two parts, one part rests in Asia, the other in Avrupa, i.e. Europe. Fortunately for us, my host was an amazing organiser of events and we settled and had iftar on Turkish soil with some Turkish and Bengali friends. Strolling in the night-time in Istiklal Street is a must when in Istanbul -- the city is brightly lit up and this is the popular tourist area near to Taksim square. Later on in my walks on this road I discovered that the buildings of the area are very old, with their unique stairs and narrow grandness. The Internet cafes, hostels, discos, language schools are some of the businesses that operate on the side streets. The bookstores were lovely, little sanctuaries I craved but there I made no purchase. One must try out the ice cream from Karama Maras city that is available in Istiklal. One of my regrets is that I did not taste 'sade' flavoured ice-cream one last time before I left the city. From Istiklal, one of the side streets led to the French street, a narrow road that is such a wonderful gush of culture and colour, with the cafes that beckon to you. Each turning in Istanbul has something curious, in graffiti, ornate stairwells, or shop displays. I did enjoy my solitary walks in the narrow old and hilly roads, strewn with cats all over, finding my way around, trying to make sense of the map in my hands. Yes this is the city of cats, with 5-6 of each family on each stairs, all around town. For the fond appreciation of the feline race there is an attractive flower cat statue in central Taksim square. The narrow roads also take one to the Galata Tower, a beautiful monument visible from many points in Istanbul. It has historic significance, and once, in the 17th century, an aviator used artificial wings to fly nearly 6 kilometres away from this tower into the Asian side. Sadly, he was made to go on exile. The panoramic view from the top is breathtaking, a 360 degree view of Istanbul at its best! It is extremely romantic; one can see the historic monuments on one end, Golden Horn, Prince's Islands, Anatolian side and blue water on many sides. Galata Bridge is interesting too, with cafes lines up all through. I was told to try fried fish burgers on the side of this bridge. The men catch them there and then; make tasty wraps with the bread that is widely available with salads inside. I am glad I checked out the Istanbul Modern Art Museum. It had the evolution of Turkish art, and other interesting exhibits such as the hanging piano, the videos and glowing proof that modern art has no definition. The downstairs room with books hanging from the ceiling gave me goose bumps while walking underneath. The position of this building places it next to the water of Bosphorus. The Asian side of the city is mostly residential, but the areas of Moda and Kadikoy are popular. Kadikoy is a nice place, with its red hot-air balloon café, and the Hayderpasa station nearby. This building was built in the early 20th century by German architects, following the renaissance style. It is magnificent, yet lost its glory over the years due to advancement in travel communications. Judging by so many 'evil eye' available in this country, we humoured how Turkey must be well guarded from evil glances! The symbol is everywhere, adorning buildings for protection and trinkets with it found all over Grand Bazaar area. The second day I was there I hunted down the book bazaar called Sarhaflar Carsisi right next to the Grand Bazaar. It took me ages hunting down English titles and finally secured a few at 5 lira each. Not too many shops sold English books as such, yet this was the Nilkhet of Istanbul for sure! Istanbul's history is held by the various palaces and monuments from centuries ago. There were the fortifications and city walls. Topkapi palace is one of the most prolific ones, with its courtyards, galleries and the amazing balcony where the Ottoman sultan would bask in the view of the Marmara Sea. Topkapi was like a city in itself. There are amazing collections of historic emblems and we were awe-struck at the number of libraries that were there! Similarly Dolmabahce Palace was a good treat as well, yet its design is European and this was made around the downfall period of the sultans. Its extravagant collection of chandeliers, crystal staircase, carpets, gold, rugs are impressive. I loved the flowers outside in the courtyard, and the quays that were being guarded by men in uniforms. At the back of the palace I was chasing the majestic peacocks and turkey birds wandering around. There is a clock exhibit here which was interesting and a whole building of crystal exhibit too. Istanbul also contains a museum of history of Islamic science and technology that is worth a visit. Hagia Sophia and the Blue Mosques are other wonders of this city. The whole Sultanahmed area has great things to see, but food is definitely costly around here. The time we had was not enough to see everything in the third largest European city that is Istanbul. Yet we were amazed at the incredible mix of the east and the west, old and new culminated to create a city that was the European City of Culture 2010. This was the centre of so much power and glory in the centuries we left behind. When in Istanbul you know the existence of the seven hills that created the city. The nightlife, the lights, the history and the pencil-sharped minarets of mosques everywhere are captivating, leaving one mesmerised and a little bewildered at the mix. I shall always remember the feeling of passing the Bosphorus Bridge every time, crossing the continents, as if it was an accomplishment. Taking the metro from Kabatas line, watching the blue water, passing the ships at Eminonou, entering the area with walls of history in the Golden Horn -- memories from Istanbul are painted such in my canvas. 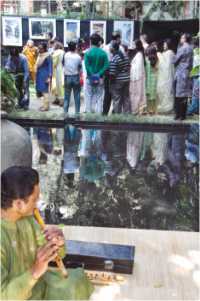 An exhibition, A Tribute to Panam Nagor, has been inaugurated on 18 February, 2012 at Khazana, House # 9, Road #55, Gulshan-2. Organised by Arts Council Dhaka, the watercolour show aims to capture the pulse of the lost city. The venue can be argued to be a good one. The event is going on at the beautiful outdoor of the restaurant. The fountains and the trees score the place as a beautiful and peaceful platform for an exhibition that attempts to bring back to life a city that primarily now exist in the mind. And that is what the show is all about. Artists articulated the feel of the city on the canvas, from their minds. Since each mind is unique, it gave the opportunity to see Panam Nagor from different perspectives. But of course, most of the paintings successfully brought the magic of this city we treasure so much. The surrealism… the magic… and the romance of calendar pages long gone and a city that now haunts. This is what the paintings are all about: they evoke a mesmerising feeling that makes you step into Panam Nagor. The live performance -- traditional, folk music -- is a good addition to the environment. Also, in one corner of the garden, a video presentation of a collection of photos of Panam Nagor is shown. Some of the watercolour paintings, rather precisely, express the architecture of the city. The doors, the grand designs on the walls and the geometry of the buildings itself, has been portrayed nicely. On the other hand, another set of paintings leave a lot to your own imagination: shades of unsaid expressions left to ponder upon. Panam Nagor, situated in Sonargaon, was a thriving city that used to be a haven for traders. Businesspeople from as far as Spain set foot in this land. The city is now an attraction for many tourists. Arts Council Dhaka hopes to promote such historical places among the general people, whilst, of course, uniting and promoting artists.